There are more than 975,000 registered buses in the U.S., yet in 2016 there were only 225 fatal bus crashes. However, the 264 lives that were lost in these accidents are far too many, considering that most bus accidents are preventable (statistics from the Federal Motor Carrier Safety Administration FMCSA). Buses, whether tour, city or school buses, are large, heavy vehicles on the road, and they therefore carry a considerable accident risk. Bus crashes can often be more serious than car accidents because of the sheer weight and size of the larger vehicle. When an individual experiences injury or property damage in a bus accident, or loses a family member in a fatal crash, it's vital to determine the cause of the accident to determine who is responsible. Bus company negligence. Negligence on the part of the bus company is a frequent cause of accidents. The industry is regulated, but bus inspections and record-keeping requirements are not as strict as those of the airline industry. In many companies, their bus fleet is aging and may not have seat belts and other safety equipment. An accident may be caused by poor maintenance or inadequate driver training. Driver negligence or reckless driving. Laws that regulate bus drivers may be ignored. These include hours of service regulations that limit how long a driver can be on the road and specify required breaks; bus speed; turning and passing protocols. Driving while impaired by drugs or alcohol is extremely dangerous as well as illegal. A driver may be distracted by mobile phone calls or texts. And driver fatigue, often caused by obstructive sleep apnea, puts drivers at 2.5 times the risk of having a highway accident than other drivers. Weather or road conditions. Hazardous weather or road conditions don't often cause a bus accident, but because of the vehicle's weight and difficulty maneuvering, these scenarios can make a bus crash more severe. Bus drivers must receive the proper training to operate the vehicle in all types of weather and to take precautions such as reducing speed when the weather is poor. 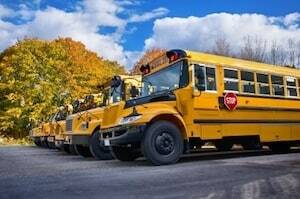 Victims of bus accidents may have a case for a wrongful death or personal injury claim. Our experienced attorneys can help determine if the bus driver, bus company or a parts manufacturer, or another entity, was careless or negligent and may be held responsible.